Cloth napkins are cheaper for your kitchen. Cloth napkins are cheaper for your planet. First, I would call grandma. See if she has a few, or a hundred, to spare. Then mom or your mom-in-law. Then I would look around my own house. Bandannas make nice, light napkins (though mine are all used for wrapping gifts). How about those kid washcloths you don't use anymore? The crafty-types have probably already turned every piece of scrap fabric into napkin squares by the time they reach this paragraph. So I'll just remind you to finish off the edges. If you can stand it, you can try thrift stores or estate sales. This doesn't fit well with me AND they are often white (see: What should I buy?). Discount department stores might have some on sale but I treated myself and got mine on Etsy. I bought from the lovely Kathryn at Smartkin. I went to her "sale" tab and asked the kids which patterns they like. Then I bought two of each to stave off dinnertime tug-o-wars over princess napkins. Okay, pay attention here. Buy dark, buy patterned. See this cute Hello Kitty napkin? It's white. White = visible stains. White gets the "Thumbs down". Now see this red napkin? Red gets the "Thumbs Up" on pasta night. All of my napkins are made of thin cotton and have shown wear after a year or two of use. Let me know if you have better luck with a sturdy linen. I have two per person and I wish I had more. So I'm gonna say 3 - 4 per person. Not so many the kids think they can get a new one every meal. It all depends on how dirty you can stand your napkins (we reuse our napkins over several meals, sometimes days) and how often you want to clean. And - buy some for guests and hide them. Tuck them away under silver that needs to be polished because you don't want anyone going near them until you actually have guests. We usually use each napkin 1-3 days in the house, depending on the meals we make. A greasy, yellow curry might be a non-stop ticket to the laundry room. The girls take napkins in their school lunches. The adults should probably try this as well. My favorite use for napkins OUTSIDE the home is for fruit transport. Wrap an apple, orange or semi-hard fruit (no berries is what I'm getting at here) in your napkin, consume said fruit, then use the napkin to contain the core, peel or pit. Oh, and you can also use the napkin to wipe your hands and face. How novel! How do I take care of my napkins? With a growing family, we aren't exactly Gosford Park over here in Mac 'N Cheese and Taco Tuesday-land. So our napkins get messy and they are washed every few days. If you have a particularly messy night (like a red, or worse, greasy sauce), get that napkin wet and keep it wet(ish) until laundry day (or night, if, like me, you realize at 8pm the kids are out of undies). Some people like to have a soaking bucket, like you would for cloth diapers. I just get it wet while washing the dishes and keep it in sink while the dishes drip dry. 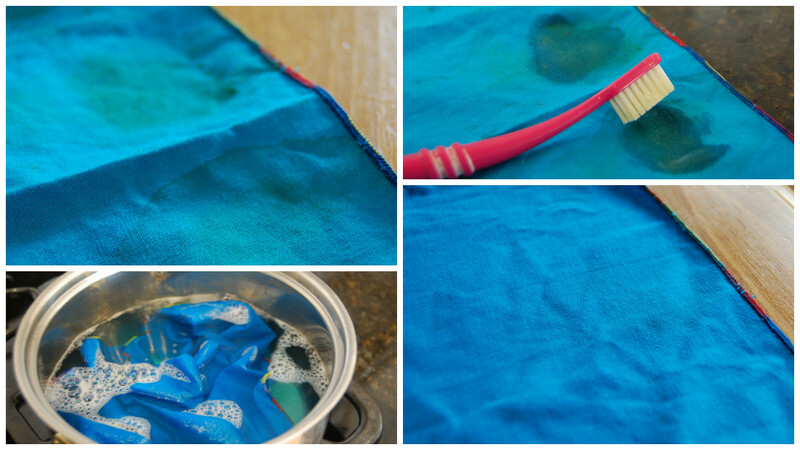 I wash my napkins in warm water and I might treat stains with some DIY stain remover. If you care about wrinkles, cotton is the worst but you can 1) hand-smooth out on a flat surface and let air dry or 2) pull from washer, give a good shake and line dry or 3) yank those babies out of the dryer ASA it stops. OR...you can give your children the gift of time by acclimating them to wrinkly linens. Super duper stain? Try rubbing in some dish detergent with an old (or someone's, it's up to you) toothbrush. Let it sit for some time, then boil it for a bit, and then wash like normal. BONUS: napkins are a "small" chore. Meaning small hands can do it. Folding napkins is one of the jobs assigned to the youngest. It's not always pretty, but it's one less thing for mommy to do...so I have more time to spend on Etsy. Ugh....I am so bad.